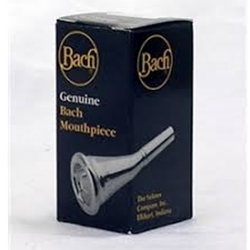 Bach mouthpieces are designed to meet every conceivable playing need and have for nearly three quarters of a century. A Bach mouthpiece can make a good instrument play better. Volume and excellent intonation; ease of response in the high and low register; rich, uniform timbre throughout the range; resistance calculated to increase the player's endurance - these characteristics explain why the best professional artists choose Bach.